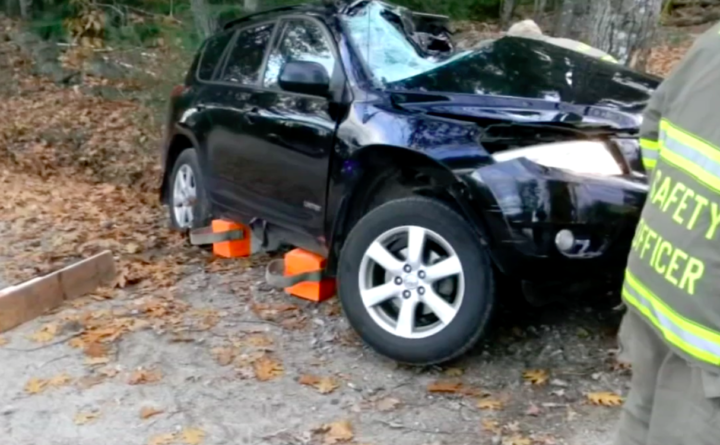 This Cumberland County Sheriff's Office photo shows the Toyota RAV4 which crashed in Harrison Thursday. Two 16-year-old girls are recovering after a car crash in Harrison Thursday. The driver lost control of the vehicle, hitting a tree on the side of a road, according to deputies. The Cumberland County Sheriff’s Office says the girl who was driving was going more than 70 miles per hour in her Toyota RAV4 along Summit Hill Road. Neighbors say speeding along Summit Hill Road is a problem. The sheriff’s office says the 16-year-old passenger was able to get out of the vehicle, but the driver had to be cut out by emergency responders. She was taken by helicopter to Maine Medical Center with fractures in her legs and arms, deputies say. The Maine School Administrative District 17 superintendent says the driver attends the Oxford Hills Comprehensive High School and that he is happy the crash didn’t end up being worse. “They are very lucky given the impact,” Stewart said. The sheriff’s office reconstruction team is investigating this crash.